KitchenDance Disposable Aluminum 4 oz. 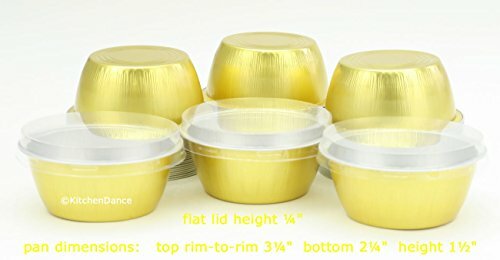 Ramekins- Pack of 100- Color & Lid Options (With Flat Lid, Gold) by KitchenDance at My Beautiful Cake. MPN: ALU-50. Hurry! Limited time offer. Offer valid only while supplies last. Premium Colored foil cups can be used for a wide variety of baking uses. Make individual desserts, souffles, cupcakes, flan, creme brulee and so on.